The thought of hosting a Thanksgiving gathering makes me a little bit woozy, in fact. There is so much planning involved! It’s kind of like Tetris, except instead of fitting together colorful shapes, you’re figuring out when to put the gratin in the oven when the breadsticks need to be cooked at the same time, but at a different temperature or how you’re going to cook 5 different things on the stovetop when you only have 4 burners. Also, there’s no Russian-y Tetris music playing while you figure this stuff out, which makes it much less fun. Well, this is the kind of main dish that makes things a little bit easier. Here’s the game plan: you make the pesto and the Brussels sprout topping the day before. On Thanksgiving day, you’ll prepare the puff pastry crusts and top them—they only take 15 minutes total in the oven, so after your gratins and casseroles and whatnot have finished cooking, cover them to keep them warm, then pop the tarts in the oven. It’s nice to have vegetarian main dishes that double as sides for everyone else on Thanksgiving—less alienation! I’ve paired Brussels sprouts with apples before and it’s one of the most popular recipes on Oh My Veggies. Brussels sprouts go so well with a little bit of sweetness. This tart is the perfect balance of savory and sweet flavors, with a flaky puff pastry crust to boot. 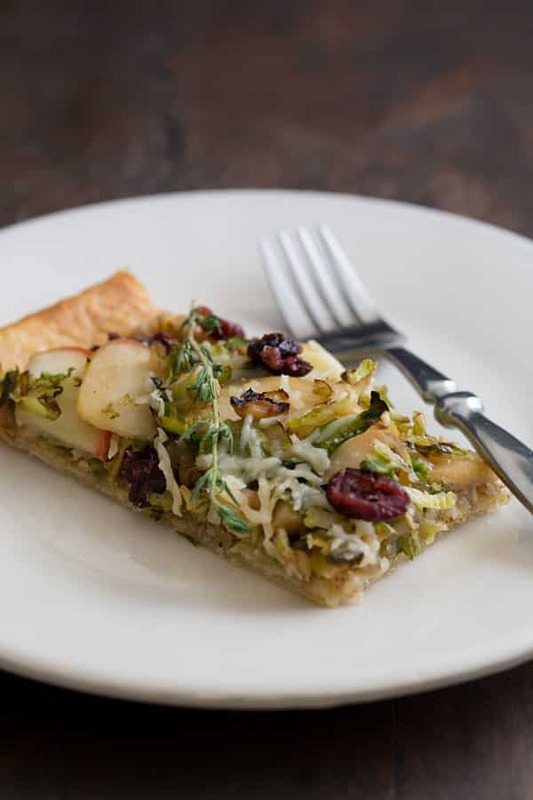 A puff pastry tart topped with Brussels sprouts, apples, and walnut pesto. Perfect for Thanksgiving dinner! Put the walnuts, 1/4 cup of cheese, and olive oil in a food processor and process until crumbly. Season with salt and pepper. Heat the butter in a large skillet over medium heat. Add the shallot and cook for about 5 minutes, until softened. Stir in the Brussels sprouts and apple slices; cook about 10 minutes more, or until apples and sprouts are beginning to brown. Stir in the maple syrup and thyme, then remove from heat and season to taste with salt and pepper. Place the puff pastry on baking sheets lined with Silpats or parchment paper; roll the pastry out to about 9 x 12 inches. Bake for 8-10 minutes, or until the pastry is puffed and golden brown. Gently press down the center of the pastry, leaving a 1-inch margin on all sides. 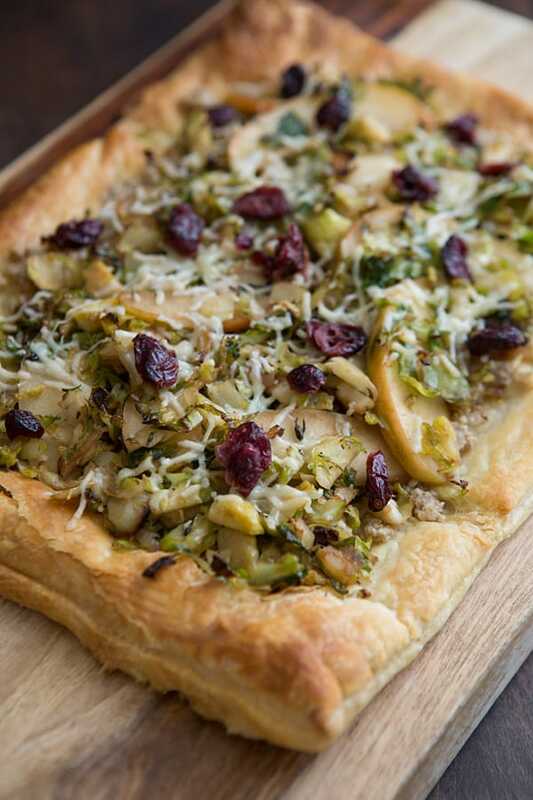 Sprinkle the pesto onto the crust, then top with half the cheese, the sprouts and apples, then the remaining cheese. (You might have some of the sprout mixture leftover.) Return to the oven for 5 more minutes to melt the cheese, then top with the cranberries. Cut each tart into 6 pieces and serve. I am in love with this tart. It combines so many of my favorite flavors into one perfect bite. I can’t wait to make this for Christmas dinner. This is a great recipe, so quick and easy and was a big hit for holiday gatherings because even if it’s not hot it stays crispy and delicious!